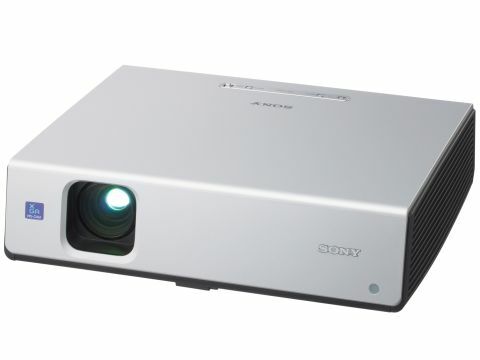 Sony is perhaps better known for its range of consumer projectors, but increasingly it is bringing the same design aesthetic to its business range. The Sony VPL-CX61 isn't so much a mobile unit as an office choice, largely due to its 3.7kg weight. It's a plain looking box with only a single D-sub connector and a power input on show. However, click back the sliding panel and you'll see exactly why it's designed for the office. You'll find a second D-sub input, along with audio-in support, then there is S-video, video as well as audio output to a monitor and audio-out port. Comprehensive it may be, but you won't find networking capabilities, which is disappointing, especially as it's designed for ceiling mounting. If you don't need these functions, you can hide them away and you're left with the single input and the side-mounted controls. The supplied remote control is small, but allows for basic functions with ease. The default resolution of this unit is 1,024 x 768 pixels and natively supports a 4:3 aspect ratio. The Sony uses 3-panel LCD technology, which allows for truer colours and a great image size. With a 2,500 ANSI lumens rating, this is more than bright enough for any office and you won't need to exclude anything but the harshest of light. We were also impressed with how quietly the unit ran, with the motorised focus/zoom feature being louder than the twin fans running. It's big, it's bulky, but it's a surprisingly quiet and highly effective data projector. If you need a projector that can be used by a number of people in an office, this is a great option.